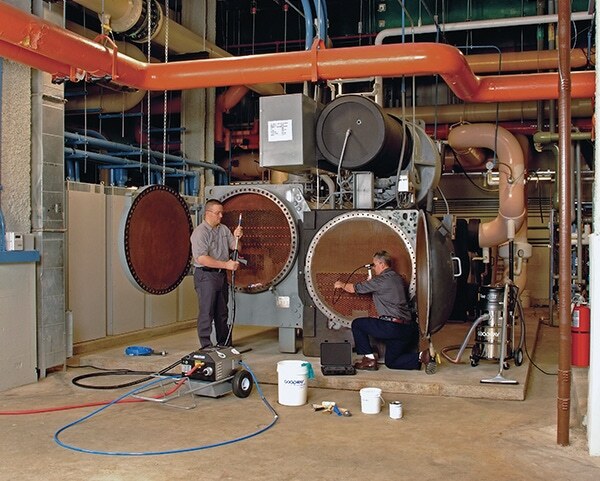 Tube cleaning is a necessary preventative maintenance task for chillers and failure to clean the tubes leads to scaling, corrosion, and reduced heat transfer through the system. 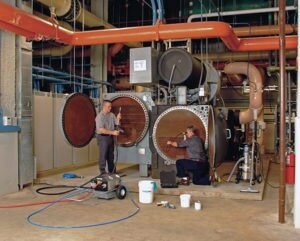 As heat transfer efficiency goes down, operating and maintenance costs go up. No matter the size of your chiller plant, from a 130,000-ton behemoth in the heart of the scorching desert to the 100-ton chiller cooling your office building, Goodway’s line of tube cleaners keep chillers running efficiently so you and your customers stay cool. Goodway Technologies is hosting a free webinar, “Cleaning and Sanitation in Nutraceutical, Bar & Confectionery Food Environments” on April 18, 2019 11:00 a.m. EST. The webinar host, Evan Reyes, will discuss trends and legislation affecting sanitation demands such as nutraceutical market growth, increased consumer awareness of food allergens and the additional challenges with FSMA, ready-to-eat (RTE) baked goods, candy and snack bars. 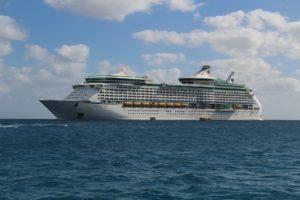 Many resorts, cruise ships and hotels do have spaces with various uses under one roof, making cleaning more difficult than a single use facility. 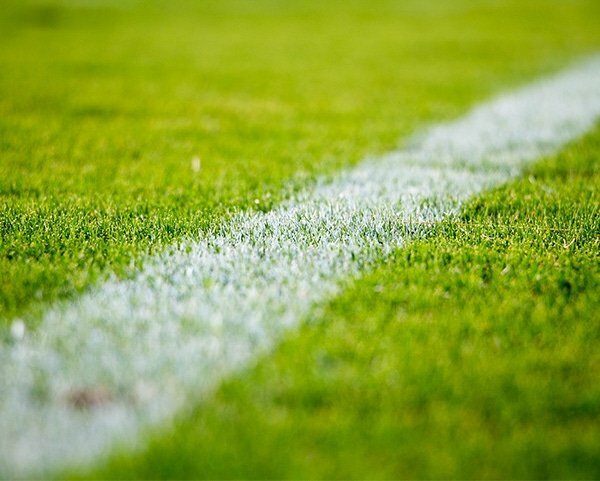 Large facilities require multiple teams to clean not only the guest rooms, but any number of gyms and locker rooms, kid’s play areas, kitchens and restaurants, snack bars, and spas. Each area has its own cleaning needs from wiping up a spilled drink by the pool, sanitizing children toys in the play area, or making sure the buffet and salad bar don’t harbor bacteria. Preventative maintenance on condenser tubes is crucial. Dirty, scaled condenser tubes can negatively impact efficiency and tube lifespan. This can cost a plant money and productivity. Download the infographic to see the comprehensive suite of products Goodway Technologies provides to clean, descale and maintain your utility plant’s condenser tubes. An October 2018 report from The National Center for Biotechnology Information (NCBI) warned that each year “close to 2 million healthcare-associated infections (HAI) occur in the US resulting in nearly 100,000 deaths.” That is an astounding statistic and one that should concern healthcare workers and patients alike. Hospitals and clinics across the country have put infection control plans in place to slow or stop the spread of HAIs. Everyone working in a hospital, including cleaning and maintenance staff, plays a critical role in the overall battle against HAIs. A 2018 connecteam survey on salaries in the HVAC industry offers very exciting news for people looking for their first job or hoping to advance into a better position. The HVAC industry’s diversity of jobs, opportunities for increased responsibility and pay, and the exposure to new technology make this an excellent field to find a rewarding, lifelong career. The growth of HVAC is bumping up against a shortage of HVAC technicians providing excellent opportunities for stable, high paying jobs for people ready to commit to building a future for themselves. Within the survey are key points related to how both entry-level and experienced employees can increase their pay over time, most notably in the areas of education and certifications, position held and longevity. Welcome to Just Venting, a blog for HVAC professionals and others who want to learn more about the environmental, technological, social, economic, and personal aspects of this industry. 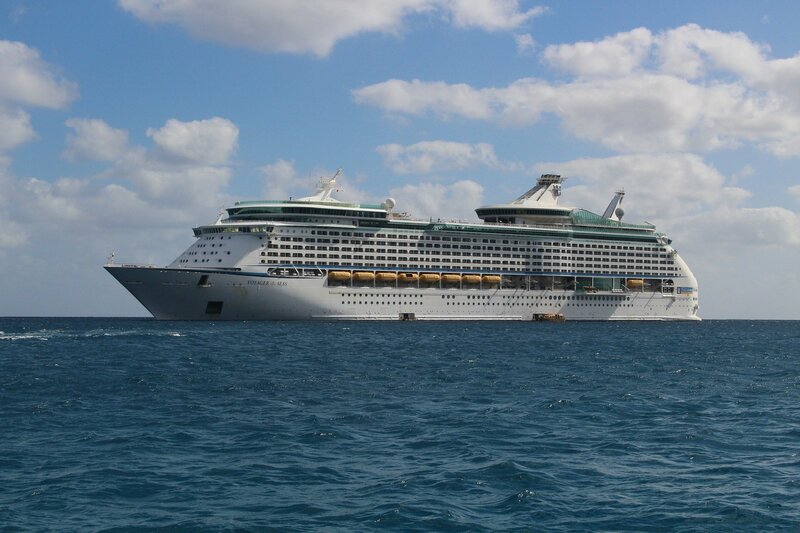 In 2007 on a man-made island off the coast of Qatar, the world’s largest chiller plant came online. The Pearl Qatar’s mechanical building is packed with fifty-two chillers each over two thousand tons providing an astounding 130,000 tons of cooling to the island’s residential and commercial buildings. In a country where summer temperatures hover around 120° F, the water-cooled chiller plant at The Pearl Qatar never slows down and neither does the maintenance staff. Your team may not be working on chillers that cool the million dollar homes of oil tycoons, but to keep your chiller working efficiently, it needs regular maintenance and cleaning just like the chillers at The Pearl Qatar. Chiller manufacturers have recommended maintenance tasks that include periodic cleaning of the chiller and condenser tubes. Chiller tubes make up the “circulatory system” of the chiller and, just like when humans veins and arteries clog, when tubes are blocked things go bad. 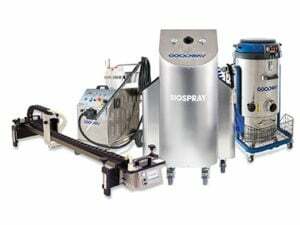 Goodway Technologies is hosting a free webinar, “Cleaning and Sanitation in Nutraceutical, Bar & Confectionery Food Environments” on April 18, 2019 11:00 a.m. EST. The webinar host, Evan Reyes, will discuss trends and legislation affecting sanitation demands such as nutraceutical market growth, increased consumer awareness of food allergens and the additional challenges with FSMA, ready-to-eat (RTE) baked goods, candy and snack bars. Participants will learn about proper cleaning techniques, best practices and available sanitation solutions. There will be a question and answer period at the end of the webinar. Register for the free webinar here. Preventative maintenance on condenser tubes is crucial. Dirty, scaled condenser tubes can negatively impact efficiency and tube lifespan. This can cost a plant money and productivity. 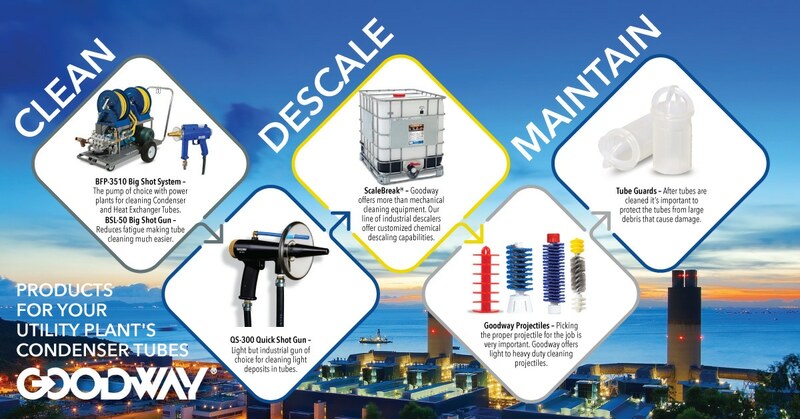 Download this infographic to see the comprehensive suite of products Goodway Technologies provides to clean, descale and maintain your utility plant’s condenser tubes.